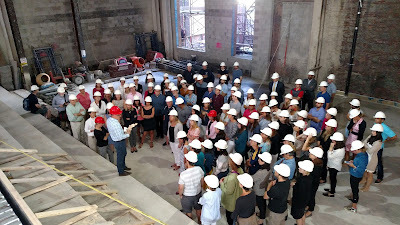 Faculty standing in space of new Performing Arts Center stage. During yesterday's faculty meeting, I took all faculty and staff on a hard hat tour of several new spaces in our soon-to-be expanded Saint David's School. They visited the new lobby, performing arts center, fourth floor gymnasium and 8th Grade commons, and enjoyed a view from above of the new middle school regulation size gymnasium. Our new middle school regulation size gymnasium space. The two beams signed by donors, faculty and boys, installed in the ceiling of the new large gym. Being able to stand in spaces that are still taking shape, but are increasingly coming into focus, provided the opportunity to imagine more concretely their powerful, positive impact on program and our community. Faculty taking in our new lobby area. These are such exciting days at Saint David's. We look forward to school starting next week as we continue to envision all that we can be--all that we will be! Each August, just prior to the beginning of school, I host a theme-related retreat for the Saint David's leadership team. Usually, we travel off campus to participate in a shared experience that is connected to the school's mission. We have hiked, cooked, raced, meditated, sailed, flown. Instead of leaving 89th Street, Cabinet members spent Monday morning in the space where our amazing new performing arts center will stand. Our theme this year is "Omnium Nobis--All that we can be." I wanted the team to explore that theme with paint. After participating in an art lesson by Art Studio New York, each team member was charged with creating a painting and envisioning the school experience and "all that we can be" as we begin a year-long countdown to the opening of our new facilities. They were inspired by iconic images of Saint David's representing our four foundational pillars, one of which is, aptly, the arts. I wanted the leadership team to spend a chunk of time "in the belly of the beast," surrounded by its bones, enjoying the opportunity to get acquainted with the "new school" and to experience the construction going on literally around them. All buildings have character, a feel, getting to "know" a new building as it begins to take shape is an important part of accepting the change it will inevitably bring. This undoubtedly will be an exciting, action packed school-year at 12 East 89th Street. Monday provided Cabinet members the opportunity to inhabit soon-to-be new space, and to quietly reflect on what is and what is to be.